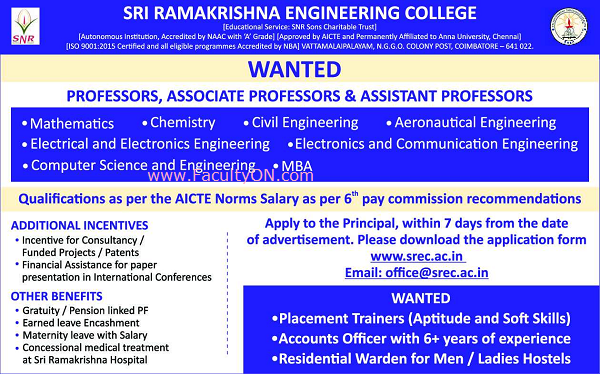 Sri Ramakrishna Engineering College, Coimbatore has advertised for the recruitment of Teaching Faculty- Professor / Associate Professor / Assistant Professor Plus Non-Faculty jobs vacancies. Interested and eligible job aspirants are requested to apply within 07 days from 05th December 2018. Check out further more details below. About College: Sri Ramakrishna Engineering College (SREC) is one among the most reputed Educational Institutions in Coimbatore region. The college has carved a niche in the engineering education by delivering graduates who make a difference in the industry and the society. Since its inception in the year 1994, the institution has been continuously striving to make an indelible mark in the higher education scenario by creating technocrats sound in academics and Value system. How to Apply: Interested and eligible candidates are requested to send application in prescribed format along with CV, copies of certificates and recent passport size photo the postal address given below. Coimbatore - 641 022, TN, India.